The Android 9 is here, the latest version of Android OS which is dubbed Android Pie has already started rolling out to Pixel and Essential phone users. Brands like Xiaomi and Huawei has also kicked off the beta program for some of their devices. Sony recently announced Six (6) of it's Xperia smartphones that will receive the Android 9 Pie update starting from September of this year and now HTC has just taken to it's official Twitter handle to announce the four (4) HTC smartphones that will receive the Android Pie update. "We're pleased as pie to confirm updates to Android Pie for the HTC U12+, U11+, U11, and U11 life (Android One). Timeframes for roll-out will be announced in due course. We can't wait to know what you think of Google's freshest slice of Android!" 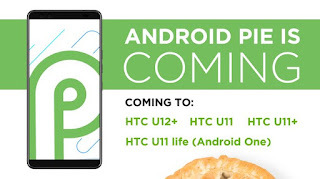 HTC didn't announce any rollout date so we don't know when the update will be pushed out, but we expect at least the beta version of the Android 9 to start hitting eligible HTC smartphones before the end of the year.